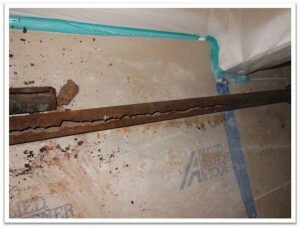 Cast Iron Pipe damage is common in Florida. Cast iron pipe has been a sewer line mainstay for decades and has an average lifespan of 30 to 50 years in the best circumstances and the soil and salt water of that seep into South Florida's land makes it often deteriorate even faster.. Over time however, as metallic surfaces come into contact with moisture, rusting and corrosion naturally set in. As these problems progress, the pipe is weakened and eventually needs to be replaced due to advanced deterioration or failure. The dangers of cast iron pipes that fail is that this allows raw sewage to seep into the soil below your house and can release harmful gasses into back into your home. These gasses can cause illness, allergies and other health conditions over time. In addition the broken pipes become a breeding ground for insects particularly cockroaches that consume the raw sewage and make their nests within the pipes eventually finding their way into your home. Cast Iron rusts and cracks over time. 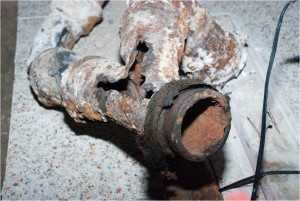 The real danger for cast iron pipes is corrosion. Over time, wastewater flow will etch a channel at the bottom of the pipe that – if left untreated – will erode through the pipe and weaken the pipe structure and allow for insects and other foriegn objects to enter the line. In addition wastewater can escape the pipe causing erosion and eventual bellies in the line that will lead to catastrophic collapse of the entire plumbing system. 1. We can best help you right from the beginning since we will have the opportunity to manage and direct all parts of your CAST IRON PIPE damage claim. This includes seeing to it that all CAST IRON PIPE damage repairs are properly made and if it's a home and you can’t stay there, that your living expenses are covered as well. 2. Even though you may have already reported your CAST IRON PIPE damage claim, we can help guide you thru the process and be actively involved as needed to obtain the best benefits possible for you. 3. If your CAST IRON PIPE damage claim has been denied, we will review the damage and provisions of your policy at no charge. Then if needed, we will file a lawsuit on your behalf to insure that you are fully compensated for your property loss and damages due to CAST IRON PIPE. 4. If more BROKEN PIPE damage is discovered after your claim has been settled, it may be reopened to obtain funds for that extra BROKEN PIPE damage discovered. "If No Recovery, You Pay Nothing"
Our initial consultation is free. After that we will represent you on a CONTINGENT FEE BASIS. This means there will be NO FEES, COSTS OR EXPENSES charged unless we recover funds for you. CALL US TODAY – TOLL FREE at 1-855-288-1818 OR submit our free CASE EVALUATION FORM for an immediate response on your BROKEN PIPE damage claim!